Children ages 8-18 will enjoy digging into this word puzzle garden! There are different puzzle patches from which to pick, but all of them focus on some aspect of our Catholic faith. If you want an appropriate puzzle for the month of May (in honor of Mary), look in the "Blessed Virgin's Puzzle Patch." If you're studying Scripture, check the "Scriptural Puzzle Patch." 77 word puzzles to intrigue and educate! Gardens are meant to be productive. The purpose of this garden is to encourage critical-thinking, to improve spelling, and to immerse the puzzler in the rich fragrance of our Catholic faith. The 77 word puzzles in this book can be used for enrichment or review. You can have several age groups use the book at once, or use the book over several years with one child. Ages 8-adult. 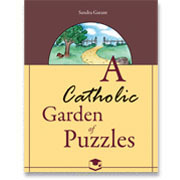 We were pleased to discover how these puzzles teach the Faith in a subtle and gentle manner. For example, the "Dogmas of Our Faith Purgation" begins by briefly explaining the difference between customs and dogmas, and then directs the puzzler to "purge the customs which are mixed in with the dogmas." Answer key included. 90 pages. Softcover. 8½"x11"